Beginners welcome! Join a lovely group for a self directed session and learn how to play this ancient game. Do you want to get fit but find the gym doesn’t suit you? 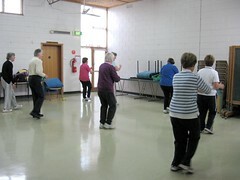 Enjoy classes with music, including strength, mobility, balance, aerobic and stretch/cool down at the end. No fancy gym gear required. Just come along and try! Become more aware of your body, breath, emotions and thoughts. Class covers joint movement, muscle strength and flexibility, breathing, relaxation and meditation. Places limited to ensure quality and safety.